After winning American Idol's fourth season, Carrie Underwood has gone onto become one of American music' biggest artists, and has proved a key figure in the sound of modern Country music. She's sold more than 65 million albums sold worldwide, had 14 No. 1 singles, with six as co-writes, won seven Grammys, and countless other accolades. Her best known tracks, including 'Smoke Break', 'Cowboy Casanova', 'Jesus, Take The Wheel' and 'Something in the Water' have had huge crossover appeal. 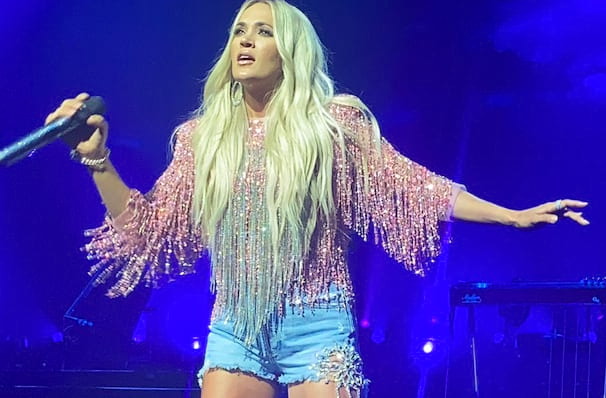 Now catch Carrie Underwood live on stage once again in 2019 as she embarks on her massive Cry Pretty Tour 360! With support by Maddie & Tae and Runaway June, this is a girl-powered fuelled tour you WON'T want to miss! Seen Carrie Underwood? Loved it? Hated it? Sound good to you? Share this page on social media and let your friends know about Carrie Underwood at PPG Paints Arena. Please note: The term PPG Paints Arena and/or Carrie Underwood as well as all associated graphics, logos, and/or other trademarks, tradenames or copyrights are the property of the PPG Paints Arena and/or Carrie Underwood and are used herein for factual descriptive purposes only. 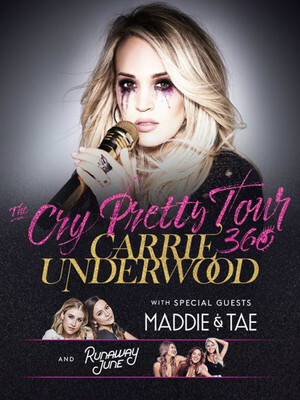 We are in no way associated with or authorized by the PPG Paints Arena and/or Carrie Underwood and neither that entity nor any of its affiliates have licensed or endorsed us to sell tickets, goods and or services in conjunction with their events.